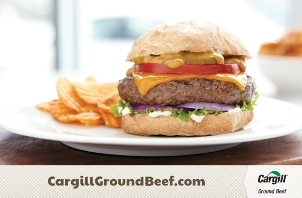 CargillGroundBeef.com provides consumers with information and an ongoing interactive dialogue about the most popular and versatile protein in America. WICHITA, Kan. - February 27, 2013 - Whether it's in the form of meatloaf, Italian meat sauce, taco filling, an ingredient in chili or the ubiquitous grilled burger, ground beef is America's favorite protein, and Cargill produces a larger quantity of it than anyone else in the world - more than 1 billion pounds annually in the U.S. and Canada. Because Americans have a love affair with ground beef, in 2012 Cargill conducted consumer research to find out how it could help them better experience it as an ongoing staple food in their diets. The extensive consumer research data Cargill gathered pointed the company's ground beef marketing team toward the Internet, resulting in the launch of CargillGroundBeef.com to provide consumers with information and an ongoing interactive dialogue about the most popular and versatile protein in America. The new website also allows consumers to share content via social media platforms including Facebook, Twitter and Pinterest. The goal is to engage, inspire, educate, incentivize and partner with consumers responsible for feeding themselves and their families. Cargill's research also revealed that an ever-increasing percentage of consumers who purchase groceries and prepare meals find information, recipes and answers to questions using tablets, smart phones and laptop computers. More often than not, consumers are relying on digital devices and access to the cyber world while they are preparing meals in the kitchen. The new Cargill ground beef website will assist them. In addition to recipes, CargillGroundBeef.com will feature farm-to-fork details about beef production, as well as food safety and nutrition, the latter focused on ground beef as part of a healthy, balanced diet and lifestyle. There will also be food preparation tips, contests and other promotional information including occasional coupons and helpful hints about using ground beef. For the 2013 NASCAR racing season, Cargill will also be leveraging its sponsorship of Roush Fenway Racing driver Trevor Bayne in a national promotion focused on grilling burgers. Details of that program were released prior to the start of the season at Daytona International Speedway last weekend. CargillGroundBeef.com went “live ” on the Internet earlier this month. Social media elements will be added in coming weeks.